(This card is always treated as an “Ultimate Crystal” card.) Cannot be Normal Summoned/Set. Must be Special Summoned (from your hand) by having 7 “Crystal Beast” cards with different names on your field and/or GY. This card cannot activate its effects the turn it is Special Summoned. (Quick Effect): You can send all “Crystal Beast” monsters you control to the GY; this card gains 1000 ATK for each card sent. You can banish all “Crystal Beast” monsters in your GY; shuffle all cards on the field into the Deck. Today we look at an old school GX boss monster from over a decade ago (hard to believe) in Rainbow Dragon. Rainbow Dragon is a Level 10 LIGHT Dragon with 4000 ATK and 0 DEF. ATK is great, but DEF is terrible. Level 10 is fine, LIGHT and Dragon are both great. This card has an errata now to always be treated as an Ultimate Crystal card. Rainbow Overdragon has this and Rainbow Dark Dragon will have this once it gets a reprint in I’m assuming an OTS Pack. 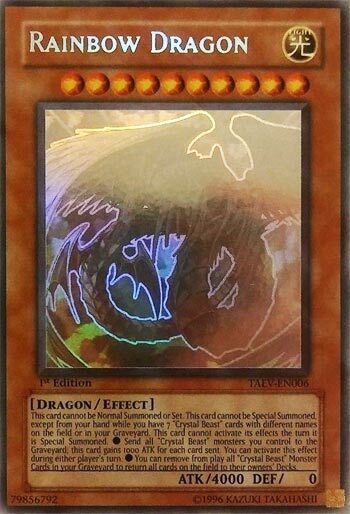 Several Spells and Traps that work with the first two Rainbow Dragons will work for Ultimate Crystal cards instead, I believe there is one exception that will remain Rainbow Dragon or Rainbow Dark Dragon since that is how it is in the OCG. Rainbow Dragon can only be Special Summoned from the hand if you have 7 Crystal Beasts on the field or in the GY, it cannot be Normal Summoned. Kinda stinks to only have 7 Crystal Beasts, especially since some of them are terrible, but it matches the Rainbow I guess. This card cannot activate its effects the turn it is Special Summoned for some reason. During either player’s turn, you can send all Crystal Beasts you control to the GY for this to gain 1000 ATK per. I don’t know if a 4000 ATK Dragon needed an ATK boost, keep your Crystal Beasts on the field unless your opponent summons something like Five-Headed Dragon or they weaken your Rainbow Dragon. You can banish the Crystal Beasts in your GY to shuffle all cards on the field into the deck. I don’t know why this goes with it, honestly they could of let Rainbow Dragon stay on the field and this wouldn’t be broken. Rainbow Dragon is thankfully easier to summon now thanks to the new support. If you are building a deck focused on summoning Rainbow Overdragon, you might as well play a Rainbow Dragon since you will be able to fulfil the summoning requirement by going into Overdragon. It does look like a GX boss monster though, if it was printed more recently, some of these downsides wouldn’t be on the card. Rainbow Dragon is one of those boss Monsters that’s hard to summon even in the cartoon. Remember when Jesse FINALLY got the card and was able to do it? It was still a very involved process. You have to have all the Crystal Beasts and send them to the Gravyeard to Special Summon this card, and at 4000 attack, that’s magnificent. The 0 defense in just as big a drawback though, as you don’t want all that investment just to have this thing changed to and destroyed in said defense mode. The attack boost is fun, certainly something to consider OTK wise, but it would be cool if the Dragon itself had some protection. Amongst all the Crystal Beasts, and now with Rainbow Over Dragon (which I wanted to look at too, so I hope we do soon, we could’ve had a Rainbow Dragon week tbh) this is hard. Rainbow Dragon isn’t bad, he’s not Tier 1, but it’s good enough to play a Deck around certainly.